The rebuilt Rec Center will have an expanded footprint. A multi-purpose room goes in where the playground used to be. A class-room block is added onto the West side. 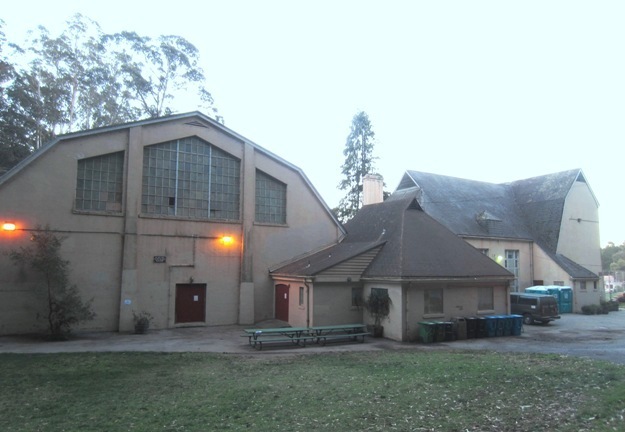 The auditorium and the gymnasium will be renovated. The stage area of the auditorium will become an “active recreation space” possibly with a climbing wall. A “Teaching Kitchen” will be added. So will some new bathrooms. One set of bathrooms will be accessible from outside even if the Center is closed. The fireplace, which is a historic feature, will be renovated (though not as a wood-burning fireplace) and the chimney stabilized by putting a concrete cylinder inside. There are no cost estimates for this. The SFRPD essentially sought feedback on two rather similar options. Those details (and diagrams of the two plan options) are HERE, together with notes from the meeting. We support the renovation. We think that this work is valuable and essential, and will provide a better Recreation Center for everyone. However, we do have concerns. 1) The plans should preserve trees. Plans focus on the building, but not on the trees and vegetation. People care about trees, and they have said their concerns were dismissed during previous community processes for the first phase of the Glen Canyon work (Grand Entrance, playground and tennis courts). We want SF RPD to take landscaping into consideration as an integral part of the process and make a strong effort to preserve trees – especially mature trees – at the Planning stage. (Karen Mauney-Brodek did say that no trees would be removed for this project; only one tree is affected, and that would be preserved.) If you’re writing to SF RPD about this and care about the trees, please let them know you want Glen Canyon’s trees to be saved. Thank them for removing no further trees for this project. 2) There’s a need for transparency. In Phase I, all through the community process, we were told that only about 10 trees would be removed. The project description said the project would be only in the flat recreational area of the Park. Instead, only after the entire community process was over we found out that first, about a third of the project was in the Natural Areas, and second, around 60 trees were being cut down and replaced with native vegetation. The community deserves to be given accurate information, which was not the case in the first project in Glen Canyon Park. 3) There’s a need for cost-effectiveness. People have pointed out that Phase 1 won’t provide recreational values or aesthetic improvements commensurate with the costs. We hope this won’t be as much of an issue in the current project, which is more focused on what the community actually wants. We would like SFRPD to focus more on what they community tells them, rather than selling a preconceived plan to the public. Let’s renovate for practical and long term use, not a signature look that gets an architect all giddy.